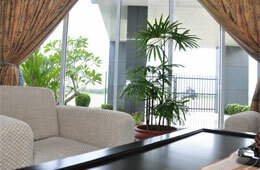 Unique feature of the Colombo Airport, Ratmalana is that, it is conveniently located 15km South of the Colombo City. Both International and Domestic passengers could experience authentic hospitality rendered and speedy clear through in all airport terminal process handled by passionate and professional team. Colombo Airport, Ratmalana is surrounded with cozy Star class hotels, Shopping arcades, tranquility of dine out places and areas for sightseeing. One who wish to travel coastal line to relax and unwind to the gentle breeze or taking a long walk on the sun kissed beach, can make their journey via Southern Expressway by entering either from Kottawa or Kahathuduwa embarking points within 20 minutes drive from Colombo Airport, Ratmalana. Colombo Airport, Ratmalana is proud to propose you to be the first to make a reservation on all hazel free events that a passenger would needed to fulfill post or pre flight, while enjoying elite of the sophisticated ambiance and upscale atmosphere at our luxurious “Silk Route” and let our dedicated staff to attend to all formalities. The lounge also has a selection of delicacies, enjoy on current events or see your favorite team play on flat-screen. One could also enjoy classic and healthy refreshments and savor the fresh flavours of beverages available at the lounge. 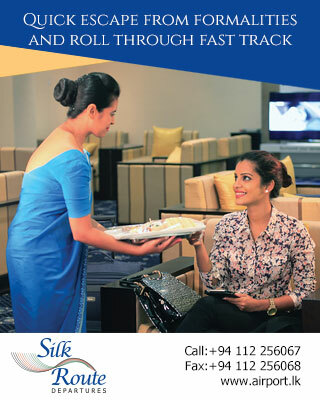 The staff at Silk Route is committed to ensure that we meet and exceed all the requirements of the passengers. They are exclusively trained to attend to passengers with special needs, so that all of our passengers are able to have an enjoyable flight through Colombo Airport, Ratmalana. We look forward to make sure that all our passengers embrace the convenience of the Silk Route. Private Jet air travels has now changed over the years as savings in travel time, convenience, flexibility, security and comfort have outweighed the cost differentials compared to commercial aviation travel for the High Net Worth Individuals (HNWIs). The trend is increasing with the growing numbers of HNWIs in Asia and around the world. The strategic significance of Colombo Airport Ratmalana is very critical on the major development projects of the country such as Colombo Financial City (Port City) & upcoming Star Class Hotels to cater the emerging business travel needs of High Net Worth Individuals (HNWIs). Customer service, social care points to the fact that airport can sometimes be one of the most stressful points of entering the domestic air travel industry. In this juncture various companies without direct control over the passenger service capabilities became our tenants at the Colombo Airport, Ratmalana and subsequently rented our hangar space for their operation. Colombo Airport Ratmalana is the Domestic Aviation Hub of Sri Lanka and facilitating all 15 Domestic Airlines in all aspects and there are a number of requests from new operators and existing operators for expansion. We offer all fixed wing and Helicopter services within Sri Lanka at fair rates. Domestic Aviation Hub strategy is focused on promoting the airport for the local, business tourists and connecting destination for international high-end tourists visiting Sri Lanka. 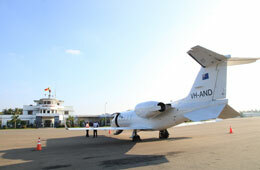 Colombo Airport Ratmalana has been utilized for Aviation training over the past decades in the history. There are around 500 students are doing studies in flying & aviation engineering at the airport and considerable percentage of them are foreign students. Therefore, along with the growth of aviation training industry, Colombo Airport Ratmalana needs to be strengthened further in order to facilitate the surging markets both national and regional levels. On par with the growing demand for the aviation related education all over the world as well as in Sri Lanka, Colombo Airport Ratmalana experiences a derived demand from Aviation Training operators. There is a great potential of the foreign students to come to Sri Lanka for Pilot and Engineering courses to enhance their knowledge and become Next Generation of Aviators. Further, improved facilities will create more favorable aviation training trend in the Asian Region.